Many cases challenging Barack Obama’s presidential eligibility have come and gone, but now an appeal has been filed with a state Supreme Court led by a newly elected chief justice who has expressed doubt about Obama’s qualification for office. Roy Moore was elected chief justice of the Alabama Supreme Court last November, a decade after he defied a federal order to remove a Ten Commandments monument from the state Supreme Court building. Now, 2012 Constitution Party presidential nominee Virgil Goode and Alabama Republican Party leader Hugh McInnish are asking the state’s highest court to force Secretary of State Beth Chapman to verify that all candidates on the state’s 2012 ballot were eligible to serve. Attorney Larry Klayman, founder of the Washington, D.C.-watch dog Judicial Watch and now head of Freedom Watch, filed the appeal Tuesday with the Alabama Supreme Court, asking for oral arguments. “We are hopeful that Chief Justice Moore and the rest of the jurists on the Alabama Supreme Court will follow the law,” Klayman told WND. The case is an appeal of a dismissal by the Montgomery Circuit Court. In his brief, Klayman says “credible evidence and information from an official source” was presented to Chapman before the election indicating Obama might not have been qualified for Oval Office. The complaint argues Chapman failed her constitutional duty as secretary of state to verify the eligibility of candidates. Moore is on the record questioning Obama’s eligibility. In an interview with WND in 2010, he defended Lt. Col Terrence Lakin’s demand that President Obama prove his eligibility as commander in chief as a condition of obeying deployment orders. Moore said he had seen no convincing evidence that Obama is a natural-born citizen and much evidence that suggests he is not. “And if the authority running the efforts of the war is not a citizen in violation of the Constitution, the order is unlawful,” he said. McInnish is a member of the Madison County Republican Executive Committee and also sits on the state Republican Executive Committee. The appeal brief notes McInnish visited the secretary of state’s office Feb. 2, 2012, and spoke with the deputy secretary of state, Emily Thompson, in Chapman’s absence. 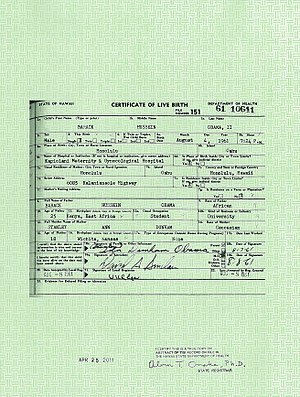 As WND reported, Arpaio and his team concluded that Obama’s long-form birth certificate was a computer-generated forgery. In his new appeal, Klayman points, as an example, to California Secretary of State Debra Bowen’s rejection of Petra Lindsay on the 2012 California primary ballot because she was 27 years old. The U.S. Constitution requires the president to be at least 35. In his conclusion, Klayman argues the fact that the election is over does not make the case moot. If the issue is not resolved, he said, citizens will be left with the impression “that their government was dysfunctional and has ignored their real concerns. In an earlier step in the case one year ago, before a panel of Alabama Supreme Court justices, one justice raised doubts about Obama’s eligibility. The justices denied a petition filed by McInnish seeking to require Obama submit an original birth certificate before he could be placed on the state’s 2012 ballot. Justice Tom Parker filed a special, unpublished concurrence in the case arguing that McInnish’s charges of “forgery” were legitimate cause for concern. The “certain documentation” is the findings of Arpaio’s investigation. Now, however, the case is coming from a lower court. Moore told WND in an interview after his election last November that the country must return to a standard in which the rule of law prevails over politics. He said Obama violated the Constitution when he bombed Libya, because the Constitution stipulates only Congress shall declare war. “No president has the power to violate constitutional restraints of power,” Moore said. Government’s job, Moore said, is to secure and protect those rights. White House spokesman Jay Carney on Monday answered growing questions about whether big donors to President Barack Obama’s nonprofit Organizing for America (OFA) are being promised access to the president. While Carney had responded “no” when Fox News’ Ed Henry asked if a recent report “suggests that access to the president is being sold,” his explanation sidestepped the issue. He offered instead a string of policy proposals, definitions and a recitation of campaign finance rules. On Monday, Carney emphasized that the group, which was born out of the president’s campaign committee, is an “independent organization”; that administration officials follow rules regarding separation between outside groups and the administration; and that the president supports campaign finance transparency. OBAMA TRIAL 15 FEB 2013 IN US SUPREME COURT–OVER OBAMA USING FAKE ID–FAKE SOC SEC NUMBER 042-68-4425–FAKE DRAFT CARD WITH FAKE POSTAL STAMP.–JUSTICE ROBERTS PUT THE OBAMA TRIAL BEHIND CLOSED DOORS–TREASONOUS–CONGRESS OPEN THE OBAMA TRIAL TO THE PUBLIC NOW. Orly Taitz, friend of The Obama Hustle will have her case against the protected one on the 15th of this month. In a hearing behind closed doors which is unheard of as far as I can tell, Taitz will have her day with the Justices. She will be using information supplied by the Obama Hustle detailing the frauds committed by Barack Obama along with other evidence supplied by experts and others across the spectrum of various expertise. 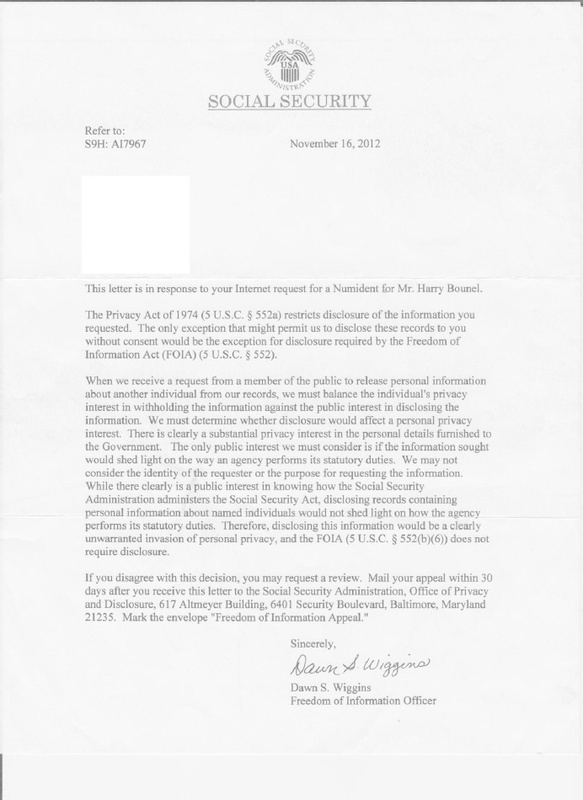 https://theobamahustle.wordpress.com/2013/01/23/breaking-news-obama-caught-using-stolen-social-security-number/ which details Obama’s crime in detail and finally connected the dots on his crime against the American people with the theft of the social security number that he stole from Harry Bounel, a man from Russia born in 1890. It is amazing how Congress and the MSM refuse to open the discussion on the so-called inconsistencies / fraud that surround this individual. 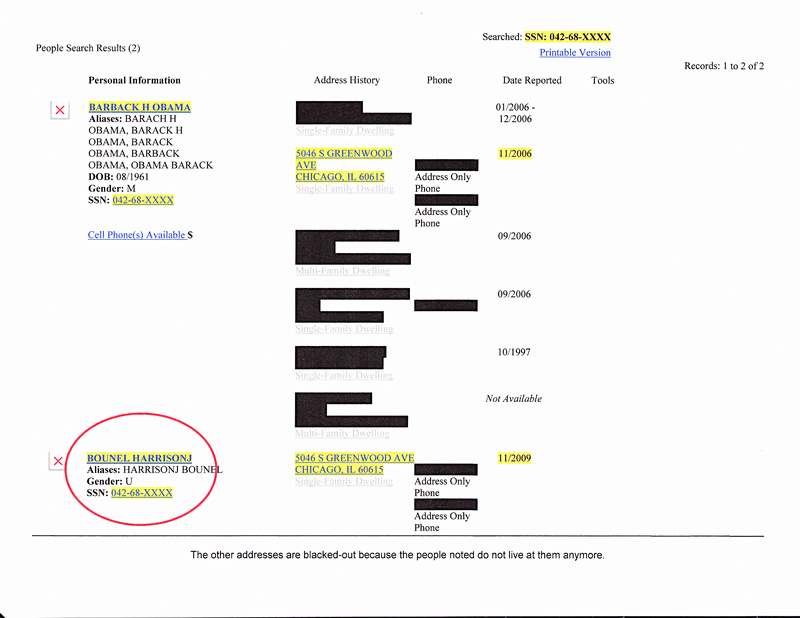 In 2011 I performed a live database pull which was actually seen by the office of FL Congressman Bill Posey which clearly proved that Obama has an alias and that he is in fact using a stolen social security number which has now been proven to belong to an individual by the name of Harry Bounel as proven by a SSA FOIA received in November of 2012. The US Congress and the MSM need to go after the criminal Obama and investigate him the way they did when Nixon was caught committing crimes within the Watergate investigation. Barack Obama is fraud who has lied to the American people and the MSM along with the US Congress are complicit in this deceit on the United States of America. Moore said he’s seen no convincing evidence that Obama is a “natural born citizen” and a lot of evidence that suggests he is not. “This is the strangest thing indeed. The president has never produced [evidence] in the face of substantial evidence he was not born in our country. People are accepting it blindly based on their feelings, not on the law,” he said. From AL.com January 11, 2013. “In a ceremony heavy on references to God and scripture, Roy Moore took the oath of office today as chief justice of the Alabama Supreme Court. Moore was joined by many relatives and a number of classmates from the U.S. Military Academy in West Point, where he graduated in 1969. An overflow crowd attended the investiture ceremony at the state judicial building to see Moore return to the office roughly nine years after he was removed for his refusal to follow a federal judge’s order to remove a Ten Commandments monument that Moore had placed in the state judicial building. Moore has said that order was wrong. He did not mention the controversy during today’s speech. He did quote George Washington from an inaugural address on the subject of acknowledging God. “It was right then to acknowledge God. And it will continue to be so,” Moore said. He also said the foundation of the judicial system was laid in Deuteronomy 1:16-17. “We’ve got to remember that most of what we do in court comes from some scripture or is backed by scripture,” Moore said. More than 100 people watched the ceremony from an overflow area on closed-circuit television. Tommy Bryan, a member of the Alabama Court of Civil Appeals since 2005, was sworn in as an associate Supreme Court justice. Bryan was elected to fill the seat vacated by Justice Thomas Woodall, who retired. Moore was sworn in Circuit Judge John Bentley from the state’s 25th Judicial Circuit, which includes Marion and Winston counties. Bentley attended West Point with Moore. Bentley introduced a number of other West Point graduates who came to Montgomery for Moore’s swearing in. Justice Michael Bolin swore in Bryan, whom he called one of his best friends. C.O. Grinstead, pastor of Trinity Baptist Church in Oxford, drove to Montgomery to see Moore sworn in. He said Moore was a long-time friend. From WND September 20, 2010. ” The military judge who curiously noted without explanation that uncovering evidence about President Obama’s birth records could prove “embarrassing” and denied an officer the right to obtain potentially exculpatory evidence in a court-martial simply has forgotten the Constitution, the supreme rule of the United States. So says Judge Roy Moore, who battled the politically correct climate as chief justice of the Alabama Supreme Court a decade ago and ultimately was removed from office by a state panel that refused to review the constitutionality of a federal court order. His comments came today in an interview with WND about Lt. Col. Terrence Lakin, who yesterday was denied permission by Army Col. Denise R. Lind to obtain evidence that could document Obama is not eligible to occupy the Oval Office. Lakin refused to follow his latest deployment orders to go to Afghanistan, because he was unable through Army channels to document Obama’s eligibility, and the president himself has declined opportunities to do so. Judge Moore, who now operates through the Foundation for Moral Law, has personal experience with challenging the powers that be to follow the Constitution. His dispute centered on a Ten Commandments display he put in a state building to recognize the God who inspired the Founders of America. A federal judge opined that the monument shouldn’t be there and ordered its removal. Moore refused and ultimately was removed from office by a state commission that he says “blindly” followed the order without evaluating its legitimacy. With her decision, Lind mirrored a number of federal judges who have ruled on civil lawsuits over Obama’s eligibility. They have without exception denied the plaintiffs’ access to any requested documentation regarding the president’s eligibility. Lind ruled that it was “not relevant” for the military to be considering such claims, that the laws allegedly violated by Lakin were legitimate on their face and that the chain of command led up to the Pentagon, and that should have been sufficient for Lakin. “The highest law in this country is not the order of the Supreme Court of the U.S., not the order of the commander in chief, or any subordinate officer,” he said. Instead, it is the Constitution, which in this particular case demands that the president be a “natural born citizen,” a requirement not imposed on other officers. “Lt. Col. Lakin has every right to question the lawfulness of the orders of the commander in chief. He’s not only the commander in chief, he dictates the whole war effort, as shown by the recent firing of [Gen. Stanley McChrystal],” Moore said. Lind found that since Congress allocates money for the war effort and the Pentagon was created, an order tracing back to the military hierarchy should have been sufficient for Lakin. “That’s wrong,” Moore said. “They’re not the commander in chief. “No order in the military can be issued without the authority that backs the order. The president didn’t give the order, but he is the authority that backs the order,” he said. With the current protocol to simply follow orders, Moore warned, the U.S. will develop more incidents like that involving Lt. William Calley in Vietnam. The atrocities of My Lai were carried out under the guise of “following orders,” Moore noted. The libertarian politician made the comments on his official House website. The latest secession controversy was started by a series of petitions on a White House website called We the People. They asked the Obama administration to comment on the possible secession of Texas, Louisiana, and other states after the president defeated Mitt Romney earlier this month. The Texas petition received about 115,000 online signatures as of Tuesday morning, with a number of people not living in Texas signing up. Paul’s comments were picked up on political websites on Monday night. “While I wouldn’t hold my breath on Texas actually seceding, I believe these petitions raise a lot of worthwhile questions about the nature of our union,” Paul said. “Many think the question of secession was settled by our Civil War. On the contrary; the principles of self-governance and voluntary association are at the core of our founding. Clearly Thomas Jefferson believed secession was proper, albeit as a last resort,” he added. “Keep in mind that the first and third paragraphs of the Declaration of Independence expressly contemplate the dissolution of a political union when the underlying government becomes tyrannical.Do we have a ‘government without limitation of powers’ yet? The Federal government kept the Union together through violence and force in the Civil War, but did might really make right?” Paul added. Legally, there is little evidence that any secessionist movement would have a chance of winning a legal challenge. Constitution Daily contributor Lyle Denniston outlined the issue last week for us. “No state, however frustrated some of its citizens may be with the present state of government in America, is going to be able to leave the Union and go its own way. That is one of the most firmly settled issues on the meaning of the Constitution,” Denniston said. The issue was settled by the Supreme Court in the case of Texas v. White in 1869, and the only theoretical path to secession would be the passage of a constitutional amendment. Associate Justice Antonin Scalia confirmed that opinion in 2006, when he responded to a letter from a screenwriter, who was writing a fictional story about Maine dumping the U.S. to join Canada. “To begin with, the answer is clear. If there was any constitutional issue resolved by the Civil War, it is that there is no right to secede. (Hence, in the Pledge of Allegiance, “one Nation, indivisible.”) Secondly, I find it difficult to envision who the parties to this lawsuit might be. Is the State suing the United States for a declaratory judgment? But the United States cannot be sued without its consent, and it has not consented to this sort of suit,” Scalia said. Paul didn’t bring up the issue of slavery in the Civil War on his official House website, but he has discussed it in the past. In 2007, Paul told “Meet The Press” said that the North should have bought the slaves living in the South and freed them, rather than pursue a war. “Every other country in the world got rid of slavery without a Civil War,” Paul told Tim Russert. In another undated video on YouTube, Paul told an audience that slavery was an important factor in the Civil War, but not the biggest reason the conflict was fought. “It really wasn’t the issue of why the war was fought in my estimation,” he said. Paul said that Abraham Lincoln, like Alexander Hamilton, believed that central government should benefit the industrial base in the North, along with a central banking system. “When they saw this opportunity, they used the issue of slavery to precipitate the war and literally cancel out the whole concept of individual choice,” he said. 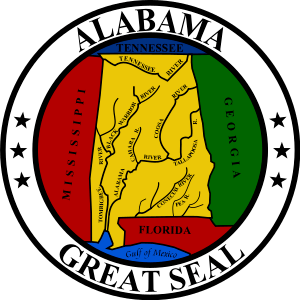 A petition has been created for the acceptance of secession from the union for the great state of Alabama. “Whereas, the subsequent re-election of Barack Hussein Obama and Joseph Robinette “Joe” Biden, Jr. to the offices of president and vice-president of the United States of America, by a sectional party, avowedly hostile to the domestic institutions and to the peace and security of the citizens of The United States of America and to the citizens of the great state of Alabama. Do hereby desire secession from the union and the formation of an independent separate state.